What is the cube root of...? How to calculate cube root in head? How to find a cube root on a regular calculator? Our cube root calculator is a handy tool that will help you determine the cube root also called 3rd root of any positive number. You can immediately use our calculator located on the left. Just type the number you want to cube root and it's done! Moreover, you can do the calculations the other way round and use it as an cubed exponent calculator. To do this just type the number you want to raise to third power in the last field! It may be extremely useful while searching for so called perfect cubes. You may read about them more in the following article. Thanks to our cube root calculator you may also calculate roots of other degrees. To do so you need to change the number in the degree of the root field. If you would like to learn more about cube root definition, familiarize yourself with the properties of the cube root function and list of prefect cubes we strongly recommend you to keep on reading this text. You can also find there some tricks on how to find cube root on calculator or how to calculate it in the head. If you are interested in the history of root symbol head to the square root calculator where it is described. And don't forget to try other math calculators, such as greatest common factor calculator or hyperbolic functions calculator. where ⟺ is a mathematical symbol that means if and only if. If you only can, you could also imagine yourself the cube root in the world of geometry. The easiest and probable the best example would be cube. Well, the cube root of the volume of the cube is the edge length. So, for example if the cube has the volume of 27 in³, its edge has the length of the cube root of 27 in³ which is 3 in. Easy? You should remember that in most cases the cube root will not be a rational number. These numbers can be expressed as a quotient of two natural numbers, i.e. a fraction. And fractions may cause some difficulties, especially when it comes to add them. If you having trouble with finding common denominator of two fractions, check out our LCM calculator which estimates the least common multiple of two specified numbers. 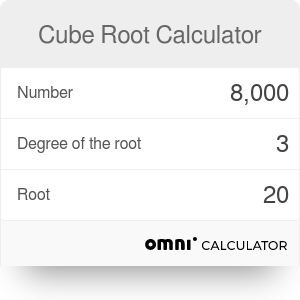 It is really easy to find the cube root of any positive number with our cube root calculator! Simply type in any number to find its cube root. For example, the cube root of 216 is 6. For the list of perfect cubes, head to our next section. Note that it is possible to find a cube root of a negative number as well. After all, a negative number raised to third power is still negative - for instance, (-6)³ = -216. You need to remember, though, that any non-zero number has three cube roots: at least one real one and two imaginary ones. This cube root calculator deals with real numbers only, but we encourage you to read more on the topic of imaginary numbers! As you can see, we operate on the numbers that are already large, but sometimes you'll have to deal with even bigger numbers, such as factorials. In this case, we recommend using scientific notation which is much more convenient way to write down really big or really small numbers. Don't hesitate to use our cube root calculator if the number, you want and need, is not on this list! 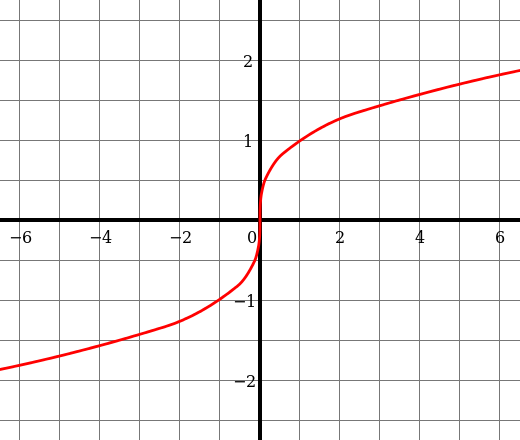 You can graph the function y = ∛(x). Unlike e.g. the logarithmic function, the cube root function is an odd function - it means that it is symmetric with respect to the origin and fulfills the condition - f(x) = f(-x). This function passes through zero. Thanks to this function you can draw a cube root graph which looks as below. We also encourage you to check out the quadratic formula calculator to look at other function formulas! Do you think that it is possible to solve little problems with cube root without online calculator or even a pencil or paper? If you think that it is impossible or that you are incapable of doing it check this method! It is very easy. However, it works only for perfect cubes. Forget all the rules in the arithmetic books and consider for a moment the following method described by Robert Kelly. First of all, it is essential to memorize the cubes of the numbers from 1 to 10 and the last digit of their cubes. It is presented in the table below. When you have a number of which you must extract the cube root look first at the thousands (skip three last digits). For example take the number 185,193. The thousands are 185. The cube of 5 is 125 and of 6 is 216. Therefore it is obvious that the number you are searching for is between 50 and 60. Then ignore all the other figures except the last digit. It's number 3, check in your memory or in our table and you know that your second digit is 7. So the answer is 57! Easy? Let's take another example and do it step by step! Think of the number that you want to know a cube root. Let's take 17576. Find two closest cube roots that you know. The cube root of 8 is 2 and the cube root of 27 is 3. So your number is between 20 and 30. Look at the last digit. The last digit of 17576 is 6. Check in your memory (or our table) - last digit 6 corresponds with number 6. This is the last digit of your number. Join the number: 26. This is the cube root of 17576! And now you can press = (equal to sign)! Here is your answer! Don't you believe it? Check it one more time with another example! To have a ball with the volume of 33.5 ml the radius should be 2 centimeters. With our root calculator you can also calculate other roots. Just write the number in the Degree of the root field and you will receive any chosen nth root calculator. Our calculator will automatically do all necessary calculations and you can freely use it in your calculations! So, let's take some examples. Let's assume you need to calculate the fourth root of 1296. First you need to write the appropriate number you want to root - 1296. Than change the degree of the root to 4. And you've got the result! The fourth root of 1296 is 6. Our nth root calculator enables you also to calculate root of not rational numbers. Let's try it with calculating π-th root. Symbol π represents ratio of a circle's circumference to its diameter. It's value is constant for every circle and approximately equals 3.14. Let's say you want to calculate the π-th root of 450. First write 450 in the number box. Than change the degree of the root - let's round and write 3.14 instead of π. And now you can see the result. It's almost 7. (-1 - i√3)³ = -1 - 3i√3 + 9 + 3i√3 = 8. Do you see now? All of them equal 8! Cube Root Calculator can be embedded on your website to enrich the content you wrote and make it easier for your visitors to understand your message.